Theodore Roosevelt, 1858-1919. 26th President of the United States. Excellent content Typed Letter Signed, Theodore Roosevelt, one page, quarto, on stationery of The White House, Washington, December 25, 1908. This letter is timeless, for the issue Roosevelt addresses is just as urgent today just as it was when he wrote this letter more than a century ago. 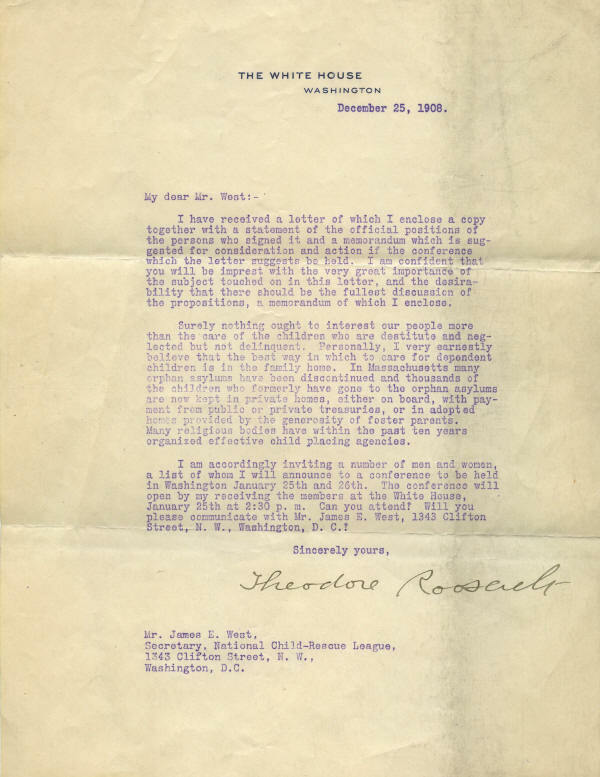 Here Roosevelt, writing on Christmas, invites the secretary of the National Child-Rescue League to attend a conference to address the "very great importance" of the problems of destitute children "and the desirability that there should be the fullest discussion" of proposals for action. It is obviously an issue that concerns Roosevelt. He explains: "Surely nothing out to interest our people more than the care of the children who are destitute and neglected but not delinquent. Personally, I very earnestly believe that the best way in which to care for dependent children is in the family home. In Massachusetts many orphan asylums have been discontinued and thousands of the children who formerly have gone to the orphan asylums are now kept in private homes, either on board, with payment from public or private treasuries, or in adopted homes provided by the generosity of foster parents. Many religious bodies have within the past ten years organized effective child placing agencies." 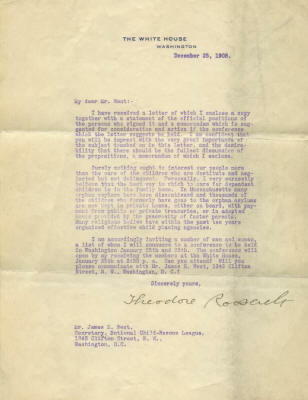 This is a form letter by which Roosevelt invited participants to the conference—as shown by the fact that the letter directs the recipient to notify himself of his attendance.  It is, however, the only copy of this letter that we have ever seen. Roosevelt has signed this letter with a bold full signature. The letter has horizontal mailing folds, vertical toning that affects the signature, and overall shows the effects of handling. Overall it is in very good condition and a desirable piece because of its content.